Outdoors one night in Houston, standard uniform. In the first part of 1995, I found an ad on the internet for a used sousaphone in Houston. Since ViaGrafix had some people in Houston at a computer show, had them buy it and bring it back. It's a silver one. 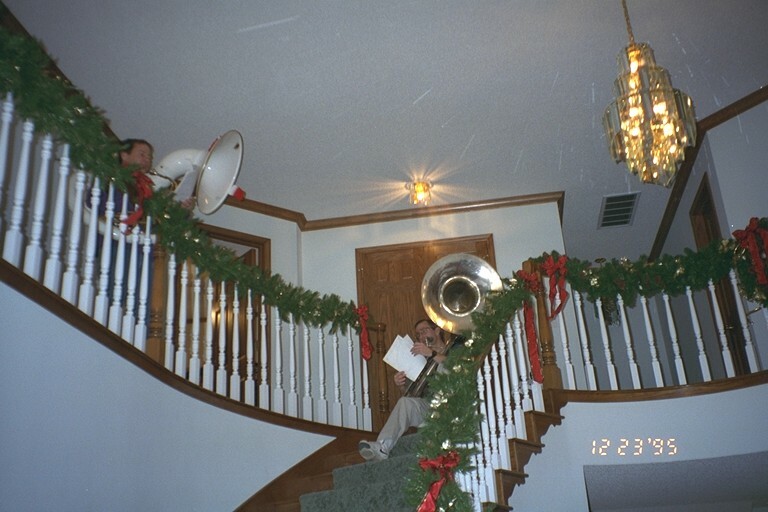 Shortly after that, Mike got a used sousaphone in Tulsa, a white one. Both are very well used. Some would say they're beat-up, but in reality they are just very well broken in. That brought up the problem of transposing music. Since I played the cornet and Mike played the trombone in school, it wouldn't have been much of a problem if the sousaphones were the same key. But NOOoooo. So I got a copy of Encore (paid for it, too!) and starting arrange Sousa marches (what else would you play on a sousaphone?) in beautiful 2-part harmony. Why did we get these in the first place? To play them on top of a mountain. A 14,000' mountain. It didn't matter which one, really, just so we carried them to the top and played some Sousa marches. The summer before, we took a jam box and some music, and sang Bruckner's Te Deum, in its entirety, on top of Mount Massive, Colorado. 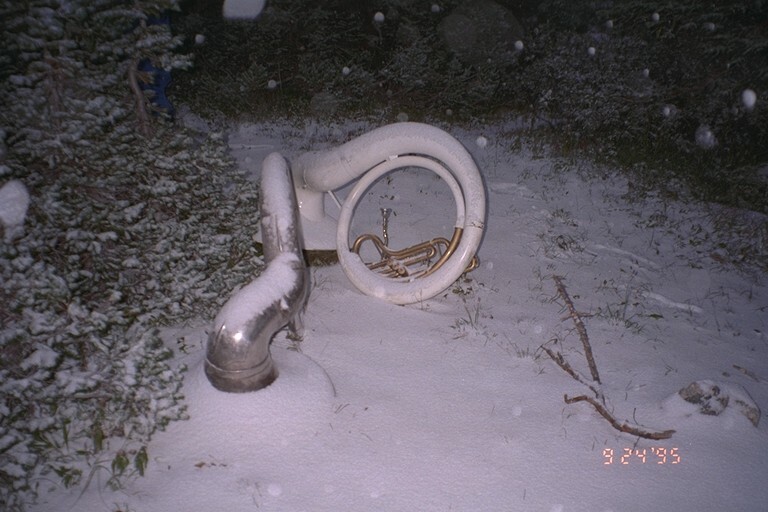 We decided then that Sousaphones would be nice for the next musical mountain. I go to several computer shows, exhibiting DesignCAD and other ViaGrafix products, with some playtime figured in before, after, or during the shows of course. It turns out that these shows are ideal for sousaphone playing, provided we don't let anyone know which company we're from. 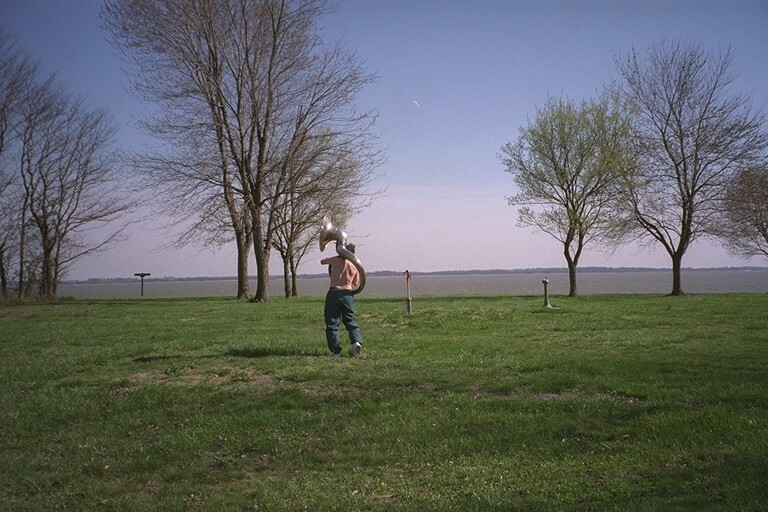 We've played at Comdex Spring, Comdex Fall twice, PC Expo, Toledo Model Airplane show (Yeah, I know. That's not computers), American Booksellers Convention, and probably a couple more. I am proud to say we weren't invited to play at any of them, nor were we invited back. It won't slow us down, though. We played at a New York Jazz club, on the New York Subway at midnight, and on Broadway (on the street, not in a play). I was even on a PBS special about Nerds, playing the sousaphone outside PC Expo. Is that a compliment? The New York Post took a bunch of pictures once, but I never did read the paper to see if we were in it. We played in front of 900 (irritated and annoyed?) members of the Houston PC Users Group. Also, we played at the Columbia Computer Society, and the Tulsa Computer Society. And, of course, we played at the Pryor Academic Excellence Foundation Banquet (uninvited, of course). The NBC affiliate in Tulsa came to our office and aired our sousaphones on the news one night. Must have been a slow news night. (In fairness to them, they did cover ViaGrafix very nicely.) And of course, Mike and I play sousaphones on rollerblades with the ViaGrafix Marching Band in the Pryor Christmas Parade. 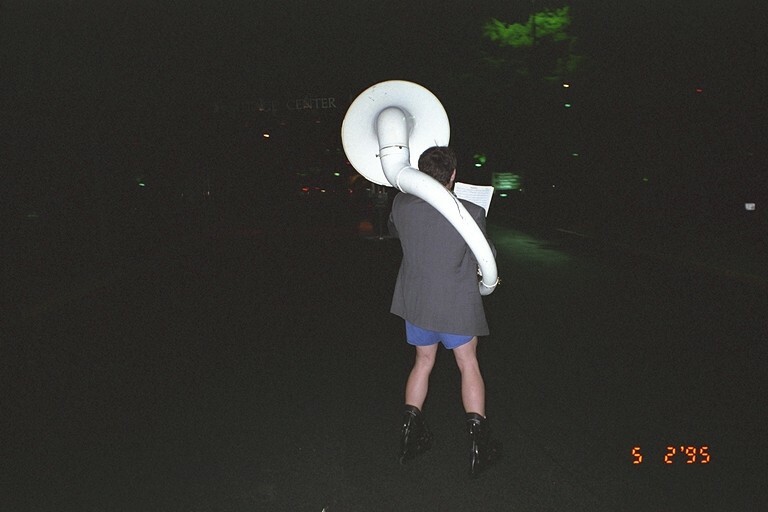 The preferred attire for sousaphone performances is shirt, tie, suit coat, shorts, and roller blades. 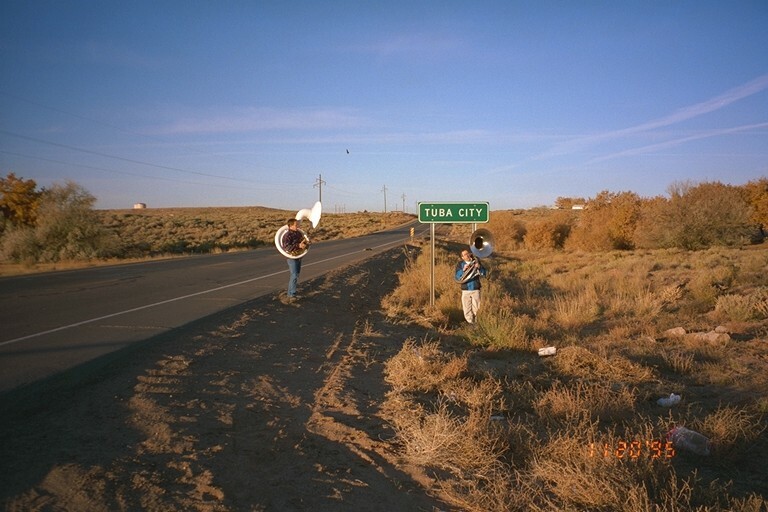 Sometimes we have to dispense with the suit tops, such as when we start off the ViaGrafix 5K run at Comdex, Las Vegas with the Olympic Fanfare arranged for two-part sousaphone. We did this at the Stillwater Freedom run once, too, and the Pryor 5K run. We're threatening to take them around the full 5K sometime, but we haven't yet. We've been asked to leave several hotels and eating establishments, obviously by some Sousa-haters. We played at the MGM Grand in Las Vegas, on stage! We weren't exactly invited, but they didn't ask us to leave either -- not even after we toured the entire casino playing Stars and Stripes!! We regularly play in the parking lots of the primary ViaGrafix gourmet restaurant: McDonalds. We occasionally play inside, but we generally use the drive-thru. And we did take the sousaphones up a mountain. 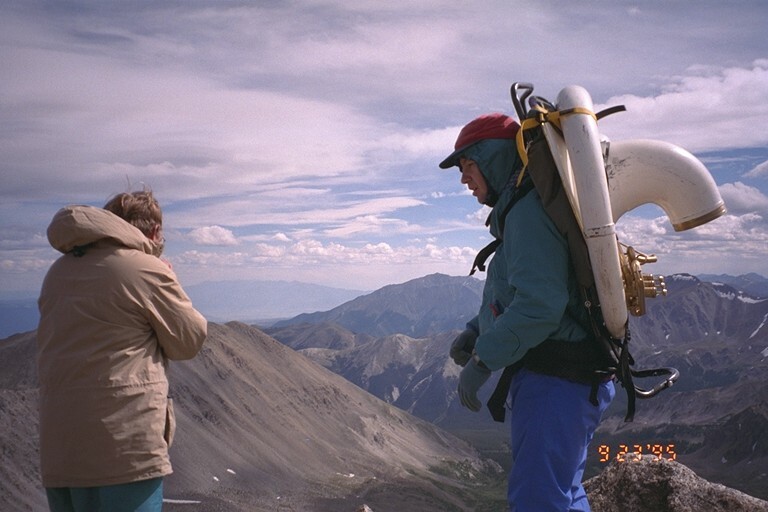 In September, 1995, Mike and I climbed Mount Harvard, Colorado, the 3rd highest mountain in Colorado, with the sousaphones on our backs. Tony Schenck and Mike Fullerton went also. They offered to help carry, but being the purests we are, Mike and I lugged them up ourselves. Down, too. The next morning, we climbed out of our tents to find a few inches of snow covering everything. We had to steal some of Dr. Mike's hot water to thaw out our valves for reveille. He didn't entirely agree to this perverse use of his valuable hot water, if I recall. 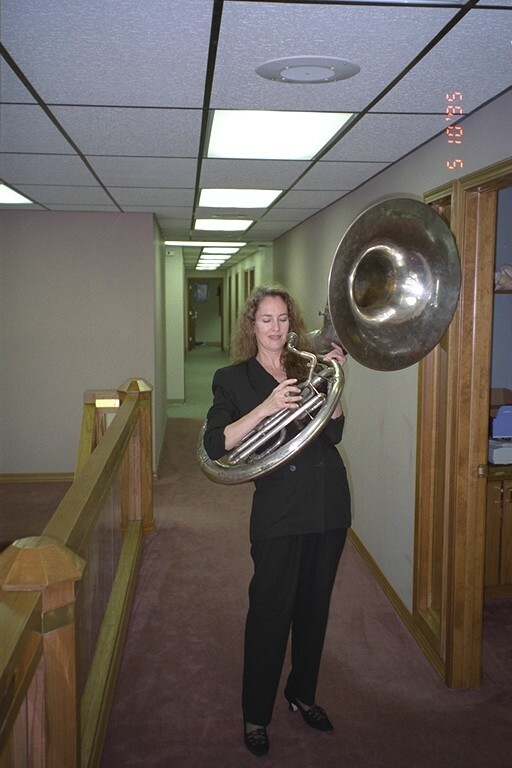 Off the top of my head, I can remember playing my sousaphone in Oklahoma, Missouri, Illinois, Indiana, Ohio, New York, Colorado, Texas, Georgia, Arizona, Pennsylvania, and Arkansas. There are probably a few others. Nowhere outside the US yet. A sousaphone won't fit in the overhead compartment or underneath the seat in front of me. You can, however, get two sousaphones, some luggage, Mike, and me into a Piper Archer. What do we play? Our reportoire includes Stars and Stripes (including the piccolo part), Washington Post, El Capitan, Semper Fidelis, Thunderer, Liberty Bell, National Emblem, and Dad's march. There are a several other pieces we play, and we fake a bunch of stuff. If I ever get around to recording some wav files, I'll put them on here for your listening pleasure and/or punishment. Where to next? Anywhere that's fun. Two performances I plan sometime: Washington Post March at the Washington Post building in Washington, DC, and El Capitan March at El Capitan in Yosemite Valley.